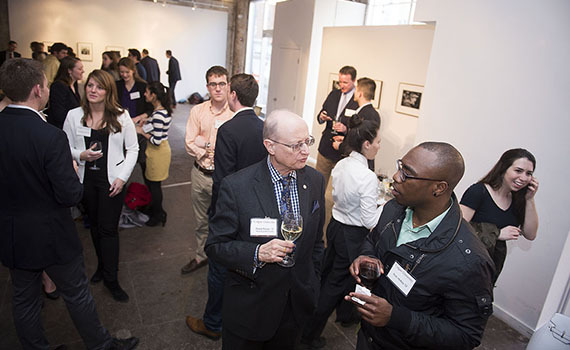 Alumni gather at the LongView Gallery in Washington, D.C., to celebrate the launch of the Common Good Professional Network on April 1.
Colgate introduced its sixth professional network on April 1 during a reception at the Longview Gallery in Washington, D.C. The Common Good Network, representing alumni across the nonprofit and public service sectors, is the fourth network launched this academic year, following on the heels of finance, digital media and technology, and health and wellness. The evening’s program included a conversation with an uncommonly good panel, moderated by President Jeffrey Herbst. It featured PeacePlayers International founder Brendan Tuohey ’96, Lakota Children’s Enrichment founder Maggie Dunne ’13, and former Senate Parliamentarian Alan Frumin ’68. More than 150 alumni attended the event. Lawyers, fund-raisers, teachers, policy experts — whatever their work on behalf of the world community, they found common cause in forming a new group to advocate for each other, for current Colgate students, and the university. In forming the networks, career services director Michael Sciola teamed up with alumni director Tim Mansfield to address the needs of Colgate community members during their four years on campus and throughout their decades as alumni. Rather than building groups by occupation, administrators looked across industries to find broader ties that could mutually benefit graduates and their alma mater. Sciola asked attendees to provide internships for Colgate students, refer other organizations that have internship opportunities, offer financial support for students seeking unpaid or underpaid internships, and take an active role in sustaining the network. The Common Good Network fulfills a particularly helpful function for the community, because, Sciola said, “in this space, it’s not as obvious where the opportunities are.” Consequently, alumni already in the space have valuable information for those who are looking for their big break. The evening’s panelists set a good example, talking about how they used their Colgate education to enter the business and, in some cases, how they tapped their Colgate connections to achieve success.